Heat oven to 350°F (325°F for dark or nonstick pans). Make, bake and cool cake as directed on box for 2 (8-inch or 9-inch) round cake pans, using water, oil and eggs. In medium bowl, tint 1 container frosting with neon purple food colour. Using 1 cake round, cut in half to form 2 semicircles. Put halves together with 1/4 cup frosting to form body. Place upright on serving plate, cut side down. Frost cake with frosting. Cut ears from construction paper; insert into cake. Using toothpicks to attach, use 2 small marshmallow halves and 2 small jelly bean halves for eyes. Use large jelly bean for nose and sour candy strips for whiskers. Place gum halves just below nose for teeth. Use large marshmallow for tail. 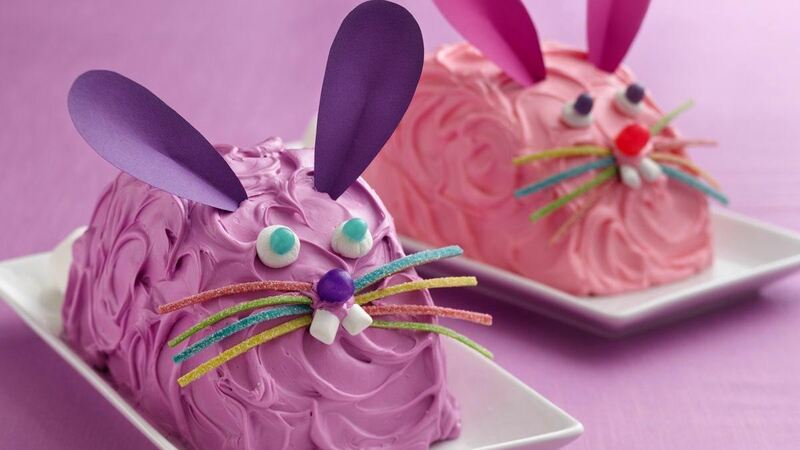 Repeat with remaining cake to make second bunny, using pink neon food color. Frost and decorate as above. Tip: Give your bunnies some grass to sit in. Colour shredded coconut by shaking it with a few drops of green food colour in a food-storage plastic bag.